Stick a fork in ‘em. The Nuggets are done. Of course, we already knew that. 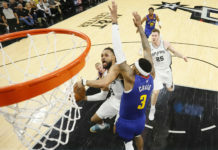 We knew that this particular team wasn’t going to make a dramatic push and overtake Portland for the eighth spot in the Western Conference Playoffs. We knew they would not take care of business when an opportunity presented itself. We knew they wouldn’t, couldn’t – can’t – execute when the game is there for the taking. A budding superstar who desperately needs just a little more help. That was all on display on Sunday. And, that was all on display all season long. The net result? An early vacation for the boys in blue. Go down the list. It’s a straightforward checklist of what’s wrong with the Nuggets. If addressed, it’s the roadmap to not only getting to the playoffs, but perhaps – probably – winning once there. The Nuggets don’t have a superstar. That’s been the case since Carmelo Anthony left town. And if that’s the case next season, the Nuggets will be in the same boat. Nikola Jokic is the closest thing Denver has to a star, but around the entire league, teams that feature a center as their star typically don’t do much (see, New Orleans; see, Sacramento-pre-trade-deadline); see, Minnesota). That’s not to say one negative thing about Jokic – he’s the real deal – but Russell Westbrook, who broke the NBA record for triple-doubles in a season on Denver’s home court, is the kind of player Jokic needs beside him. As good as Tim Connelly has been identifying young talent, he’s yet to land the big fish via free agency or trade. This offseason, Connelly must add a player who at least approaches star status. 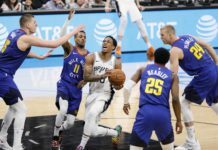 The Nuggets have more than enough money, and they’ve got young talent on the roster, something that should be attractive to a player considering Denver. The 2003-04 Pistons are widely cited as the last team to win a title without a superstar. That’s actually false – realistically they had three – and to find a team without one is an exercise in futility. Connelly and the Nuggets aren’t going to buck that trend, no matter how well-rounded they might be. The Nuggets need a finisher. Maybe that’s a superstar. Maybe it’s a veteran who simply knows how to seal the deal. Maybe it’s Jamal Murray two years from now. 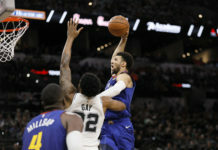 But without one (see, Westerbook; see, James Harden) they’ll do exactly what they did Sunday for as long as the NBA survives. The Nuggets just don’t execute when the game is in the balance. That’s just a fact (see, recent losses to Houston, L’s that ultimately had more of a negative impact on the Nuggets playoff hopes than Sunday’s loss). Far too many games were lost this season because of poor execution. That’s primarily on two parties: The head coach and the veterans. Michael Malone will be entering his third season in Denver, and it’s up for debate as to whether or not he’s been the right man for the job. Malone is supposed to be a defensive-minded head coach. Well, the Nuggets can’t play defense (they rank 29th out of 30 in defensive efficiency rating). Malone is supposed to be a players’ coach. Well, I’m not sure key veterans played or acted like that was the case; outside of Wilson Chandler, who grumbled regularly about being traded out of Denver, it’s unfair to speculate. But it’s also fair to say that players like Danilo Gallinari and Kenneth Faried haven’t exactly flourished under Malone. At 35 years old, Jameer Nelson is who he is. And while he’s a respectable player, he’s not the answer going forward. Those three or four veterans – like Malone – didn’t execute when it mattered most. The Nuggets get no respect. That was also evident yesterday when officials called a questionable (at best) flagrant foul on Jokic. In essence, that call fueled OKC’s improbable comeback. It’s a hard thing to wrap one’s head around, but somehow, some way, the Nuggets need to become more respected around the league (however one defines that). Gallinari and Chandler are good players. They really are. But they’re not great. They’re also a tease – and have been for years. Both can score with any of the league’s best. Neither does it with consistency. Both have been injury prone. Both still are. (Newsflash: That’s not changing, and Denver needs to move on). Both would be an excellent piece for a team that’s closer to winning a title than the Nuggets. Neither can make the Nuggets that team. There’s an important place for both of these guys within the NBA, but at some point the Nuggets need to take a long hard look in the mirror and conclude that it’s not here. 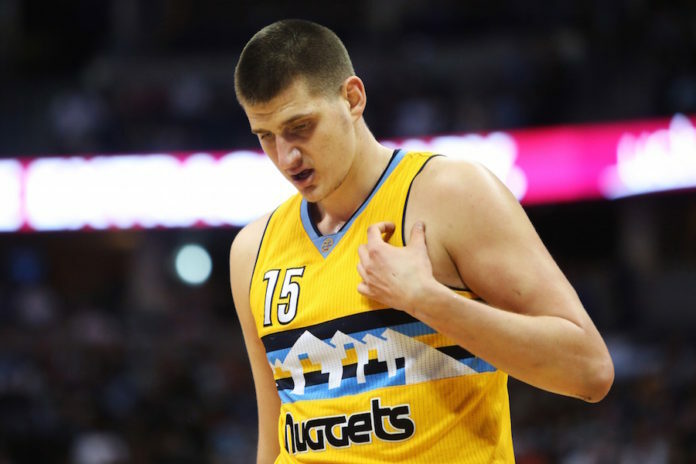 Here’s the good news though – the Nuggets do have some very bright spots. Namely, Jokic, Gary Harris and Jamal Murray. Jokic is already an elite player, but as noted earlier, an elite big man needs an elite scoring No. 2 or No. 3. That’s just the way it’s done in the NBA (see Pau Gasol and Kobe Bryant; see Tim Duncan and Tony Parker and Manu Ginobili). Harris could be that guy. He very well could be the Nuggets’ most complete player. Murray has “star upside,” it’s just that he’s so young at the moment. Even Emmanuel Mudiay might be a good player. (What exactly were the Nuggets doing with him this season anyway?) Michael Malone may have ridden his veterans hard with hopes of grabbing a playoff spot. But you know what? It didn’t work. And in doing so, the Nuggets may have stunted the growth of a very good core. If Denver cleaned house this summer, and left only Jokic, Harris and Murray (and perhaps Mudiay), they’ll be in a very similar position next season. No matter who they bring in, they’ll be better simply because of experience. But this “core” is key, because it’s really good. Yes, it’s very young, but Denver must – must! – have a sense of urgency. Surround them well sooner than later and let these three or four players learn to win. The foundation is there; the Nuggets must build upon it as if a massive storm is coming. Funny how one game can show everything a team has and lacks. Funny how that one game knocked said team out of the playoffs. There’s work to do in Denver. And it starts now.